JC virus was named using the initials of the patient from whose brain the virus was first isolated. JC virus belongs in the polyoma genus and in the Papovaviridae family. The other human polyomaviruses are BK, WU, KI, MW, STL, TS, HPyV6, HPyV7, HPyV9, HPyV12, HPyV13 and Merckel cell carcinoma. The other genus in the same family is the Papillomavirus. Unfortunately, there is no proven antiviral therapy for JC virus. The best approach is to treat the patient’s underlying disease, thus, allowing reconstitution of the immune response and, therefore, boosting the necessary cellular immune response to control JC virus replication. HIV-positive PML patients generally present with low CD4 counts. Survival of HIV-positive PML patients is approximately 50% 1 year from the diagnosis of PML. This is higher than that in HIV-negative patients. In HIV-positive patients, immune reconstitution can be achieved by treating HIV with combined antiretroviral therapy (cART). However, treatment with potent cART can result in increased risk of developing immune reconstitution inflammatory syndrome (IRIS), which can precipitate worsening and can be fatal. HIV-negative PML patients include those who have received a stem cell or solid organ transplant or chemotherapy for cancer, those with immune deficiencies, and those treated with monoclonal antibodies. Decreasing the intensity of immunosuppression due to immunosuppressive medications, especially those that inhibit T-cell function, may augment the cellular immune response and aid in viral clearance. Multiple sclerosis patients are at risk of developing PML after treatment with the monoclonal antibody, natalizumab. The biological activity of natalizumab can last for 3 months after infusion. Therefore, removal of natalizumab by plasma exchange is usually performed when PML is diagnosed. This leads to immune reconstitution and can stop JC virus replication. However, fatal IRIS has been described in these patients. Mirtazapine, a selective serotonin reuptake inhibitor, has been used based on in vitro evidence that JC virus binds to the serotonin receptor 5HT2AR. There has been no clinical trial and only a few case reports describing benefits from mirtazapine use. Mefloquine, an anti-malaria medication, has been studied in a prospective multi-center study, but no clear benefit was shown. Cidofovir, which binds to viral kinase, was thought to be effective in PML. However, several prospective studies did not find evidence support its use. Cytarabine, which showed in vitro inhibition of JC virus, failed to show benefit in survival when tested in randomized controlled studies in HIV positive patients, either when given with cART or given as an intrathecal infusion. Intravenous infusion of immunoglobulins containing neutralizing antibodies against JC virus can decrease JC viral load in patients as demonstrated in small case series. JC virus is an ubiquitous virus that infects up to 86% of healthy adults. Primary infection most likely occurs in childhood and probably by the urine-oral route. Viral latency is established in kidney epithelial cells. Up to 30% of healthy asymptomatic adults will have detectable JC virus in their urine. JC virus is prevalent worldwide. PML occurs in immunocompromised patients and is most likely due to reactivation of the virus in the brain. There is no risk for this virus to spread from a patient with PML. Immune deficiency is linked to unchecked JC viral proliferation in the brain, resulting in lytic destruction of oligodendrocytes and, thus, development of PML. A healthy immune system protects against JC virus reactivation. JC-specific antibodies are present in most of the general population, but these antibodies do not protect against development of PML. Cellular immune responses, specifically CD8+ cytotoxic T lymphocytes are associated with control of PML and improved survival. PML lesions in the brain show total destruction of oligodendrocytes by JC virus. An inflammatory reaction consisting mostly of lymphocytes occurs at the site. What host immune response is associated with this pathogen? JC virus antibodies are detectable in most adults. Reactivation is linked to a decrease in the cellular immune response. Specifically, the presence of cytotoxic T lymphocytes specific to JC virus is associated with a better prognosis in PML patients. PML is the disease caused by reactivation of JC virus. JC virus can infect and destroy oligodendrocytes in the brain. Therefore, all white matter is susceptible to infection and destruction (see Figure 1). Patients present with neurological symptoms and signs associated with the corresponding area that is infected in the brain. The symptoms can include gait abnormalities, cognitive deficits, motor weakness, coordination problems, sensory loss, and seizures. 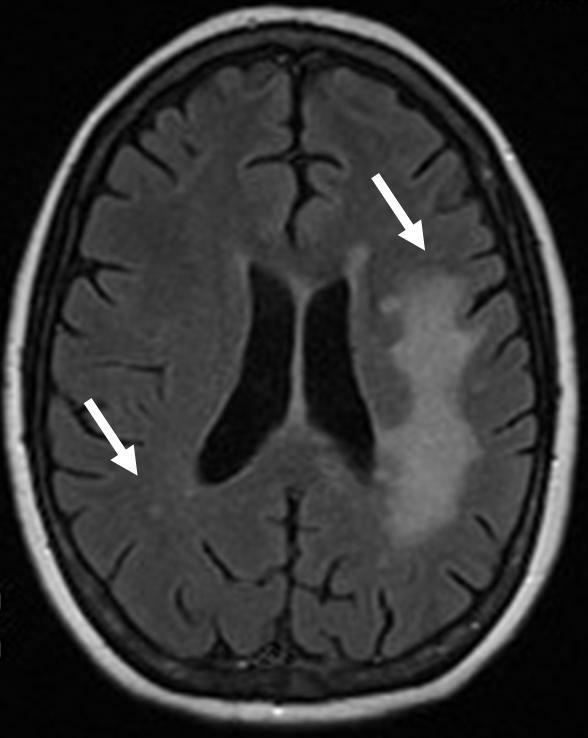 MRI image of the brain of a PML patient showing multiple regions of white matter demyelination (arrows). What other diseases are associated with this organism? JC virus granule cell neuronopathy: Unlike in PML in which oligodendrocytes are infected and destroyed by JC virus, the granule cell neurons in the cerebellum are destroyed in JC virus granule cell neuronopathy. This disease can present as the sole manifestation, or it can occur with PML in both HIV-positive and HIV-negative patients. Patients present with symptoms consistent with cerebellar disease, including ataxia, dysarthria, and incoordination. MRI indicates cerebellar atrophy. JC virus can be detected in the cerebellar lesions and has been found to contain mutations in the capsid protein Vp1 gene. JC virus encephalopathy: JC virus infects and destroys the oligodendrocytes in the white matter in PML, but several case reports have described JC virus infection of the cortical pyramidal neurons of the grey matter. The infection was manifested with global decline, aphasia, and seizures, consistent with encephalopathy. Radiographic imaging showed non-enhancing lesions in the grey matter. JC virus was detectable in the CSF. The prognosis is poor. JC virus meningitis: The true incidence of JC virus presenting as meningitis has yet to be determined, but studies reported detection of JC virus in patients presenting with typical meningeal symptoms, including headache, stiff neck, and nausea, without specific focal lesions. Diagnosis is made by detection of JC virus in the CSF. Prognosis is poor. What common complications are associated with infection with JC virus? Primary infection with JC virus is asymptomatic. The virus resides in the kidney latently, and asymptomatic shedding occurs in healthy individuals. Replication of JC virus in the brain results in lytic destruction of oligodendrocytes and demyelination. Detection of JC virus DNA by polymerase chain reaction (PCR) in the cerebrospinal fluid (CSF), the detection of JCV DNA by in situ hybridization, or finding JC virus proteins by immunohistochemical staining in brain tissues, along with clinical symptoms and appropriate radiographic images, establishes the diagnosis of PML. PCR testing for JC virus on CSF is available from commercial laboratories. Patients with a typical clinical and radiographic presentation, but negative JCV PCR in CSF, can still have a diagnosis of “possible PML” after ruling out all other causes. After asymptomatic primary infection, JC virus resides in the kidneys. Asymptomatic viral replication can be detected in the urine in 30% of healthy individuals. Furthermore, JCV DNA has been detected in tonsillar lymphocytes, in bone marrow cells, as well as in brains of patients without PML. With immunosuppression, active replication of JC virus in oligodendrocytes in the brain results in lysis of oligodendrocytes and demyelination. The JC viral capsid regions determine viral genotype, and the non-coding regulatory region is associated with neurovirulence. JC virus contains a non-coding regulatory region of 400 base pairs. This region contains transcription binding sites and the structure is related to viral pathogenesis. The so-called “archetype” regulatory region is most often present in the JC virus isolated from the urine of both PML patients and healthy individuals. The “rearranged” type of regulatory region has loss of two DNA fragments plus gain of a repeat region. This type of regulatory region is most often detected in the brain of PML patients and, therefore, associated with neurotropism and neuropathogenesis.